Nanjing University (Chinese: 南京大学; pinyin: Nánjīng Dàxué; colloquially 南大) is a national comprehensive university located in Nanjing, an ancient capital of China. It is regarded as one of the best and most selective universities in China. Its history dates back to the first year of Yong'an reign (AD 258), making it one of the oldest higher learning institutions in the world. 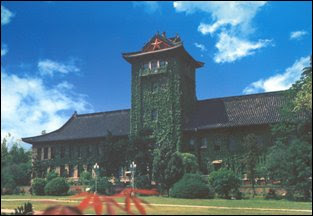 It became the first modern Chinese university in the early 1920s. Nanjing University is one of China's key comprehensive universities and it functions directly under the Ministry of Education. It is located in the ancient capital of six dynasties -- Nanjing. 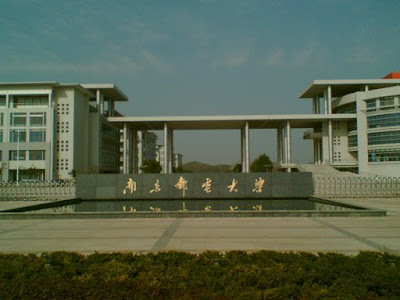 The University dates back to 1902 when Sanjiang Normal School was founded, and then evolved as Liangjiang Normal School, Nanjing Higher Normal School, National Southeast University, the Fourth Zhongshan University, and National Central University. On August 8, 1949, the National Central University was renamed National Nanjing University. In October 1950, as required by the Ministry of Education, the name was changed to Nanjing University. In 1952, when a nationwide readjustment of universities took place, some schools, such as the School of Engineering and the School of Agriculture, were separated from the University; meanwhile, the University merged with the School of Liberal Arts and the School of Sciences of the University of Nanking, which was founded in 1888. The new university remained Nanjing University and the campus of Nanjing University moved from Sipailou to Gulou. Today, Nanjing University consists of two campuses, one in Gulou and the other in Pukou with a total area of more than 3,600 mu (nearly 600 acres). It is one of the top universities in China, with beautiful campuses and modern teaching and research facilities. Its current President is Professor Chen Jun, a geochemist. The University celebrates its anniversary on May 20 of each year. Nanjing University's development has always been closely bound with the destiny of the Chinese nation and linked to her ever changing society. Nanjing Higher Normal University, the predecessor of Nanjing University, played a leading role in the area of Nanjing when the Youth Democratic Movement was held on May 4, 1919. In the early 1920s, it was in this university that a group of Chinese communist forerunners introduced the theory of Marxism to the public. The Second National Conference of Chinese Communist Youth League was also held at the University. During the Anti-Japanese War, organizations like the "Natural Sciences Forum" and the "Democracy and Science Forum", headed by Pan Shu, Liang Xi and Jin Baoshan, renowned professors of National Central University, eventually became the democratic party "Jiu San Society." During the Liberation War, teachers and students of National Central University stood at the forefront through out the democratic patriotic movement. On May 20, 1947, students of National Central University initiated an "Anti-Hunger, Anti-Civil War and Anti-Persecution Movement", later known as the "May 20th Patriotic Students Movement." After the National Central University was renamed Nanjing University, the truth-seeking convention was carried forward. In May 1978, one scholar at the Philosophy Department published, in the Guangming Daily, a well-known essay entitled "Practice Is the Sole Criterion for Testing Truth" and thus evoked "a heated discussion on the criterion of truth" that attracted nationwide attention. In its history of more than 100 years, Nanjing University has cultivated a great number of prominent and learned figures, having thus contributed much to the nation's revitalization and development. Many famous scientists and scholars, such as Li Ruiqing, Wu Youxun, Zhu Kezhen, Mao Yisheng, Liu Yizheng, Hu Xiaoshi, Tao Xingzhi, Guo Bingwen, Chen Heqin, Tang Yongtong, Ma Yinchu, Li Shutong, Xiong Qinglai, Tong Dizhou, Jin Shanbao, Wen Yiduo, Zhang Daqian, Xu Beihong, Fu Baoshi, Yan Jici, Wu Jianxiong, Li Guoding, Luo Jialun, Gu Yuxiu, Li Fangxun, Wu Mi, Zhu Guangya, Zhao Zhongyao, Pearl S. Buck, Yang Xingfo, Lu Shuxiang, Liang Xi, Dai Anbang, Chen Baichen and Kuang Yaming, have studied or worked here. Of the 23 distinguished scholars recognized by the nation for their pioneering work on the founding of the country's high-tech system, six are from Nanjing University. Since China's reform and opening, Nanjing University has gradually developed multi-disciplinary programs in humanities, social sciences, natural sciences, technological sciences, life sciences, modern engineering and management. 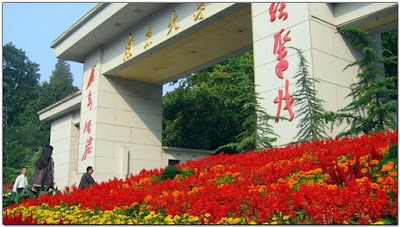 At present, Nanjing University has 17 schools with 50 departments. It runs 74 undergraduate programs, 186 master's programs (with six programs designated by the University itself), seven professional master's programs; 16 primary disciplines for doctoral degrees, and 122 Ph.D. programs (with six programs designated by the University itself) as well as 18 post-doctoral stations. In addition, the University has 28 national key disciplines, 10 provincial key disciplines, and 6 national key laboratories. It also houses 11 national training bases for the research and teaching personnel in basic sciences and liberal arts, and three bases for humanities and social sciences research appraised by the Chinese Ministry of Education. Among the nearly 2,000 teaching faculty, there are 654 full professors, including 27 academicians of the Chinese Academy of Sciences, three academicians of the Chinese Academy of Engineering, four academicians of the Third-World Academy of Sciences, and one academician of the Russian Academy of Sciences. There are two premier scientists for the National Key Development Program in Basic Research (Project 973), and also 19 middle-aged and young scholars nationally appraised for remarkable contributions, 70 winners of National Outstanding Youth Fund, 36 specially appointed professors for the nation's Cheung Kong Scholars Program, 29 scholars supported by the Supporting Plan for New Century's Outstanding Talents of the Ministry of Education, four National Renowned Teachers, and 574 Ph.D. supervisors. With its multi-disciplinary structure and highly qualified faculty, Nanjing University is one of the leaders in educational operations among Chinese institutions of higher learning. According to statistics, from 1992, the number of research papers by Nanjing University on the Science Citation Index (SCI) ranked first among all universities in China's Mainland for seven years successively. And for eight years in a roll, the number of articles cited by academic circles abroad ranked highest of all Chinese universities in the mainland. In the recent decade, Nanjing University has won over 800 national, ministerial and provincial awards, including over 40 National Awards for Natural Sciences, Scientific Progress and Technological Innovation. Since 2000, the University has won 9 National Second Awards for Natural Science. Since 1994, the number of National Natural Sciences Fund programs and National Social Sciences Fund programs undertaken at Nanjing University has been among the highest of all Chinese universities. Nanjing University has made remarkable achievements in personnel training. At present, the University has over 41,600 students, including 9,964 Ph.D. and master's degree students. With a solid academic foundation and strong potential for career development, the graduates of Nanjing University have been well received by employers in China. In the international academic circles, seven graduates of Nanjing University have won the American President's Awards. Many attainments and findings from research projects have been named after the graduate students and their supervisors of Nanjing University, such as Zhou-Gong: Distributing Mutual-Changes Theory and Wu: Solidarity Theory.In the International English Speech Contest held in the UK, students of Nanjing University won two championships. In 1994 and 1995, the students' debating team of Nanjing University won the national and international championship in debating competitions. And in 1999 Nanjing University was the first comprehensive university endorsed by the Ministry of Education to pass a national evaluation of undergraduate teaching in China. Nanjing University provides a good environment for teaching and research. Its library contains over 4.29 million volumes, ranking among the top ones of all the universities in China. There are currently 116 institutes of various types, 87 interdisciplinary research centers and some large teaching, research and experiment facilities such as the Analysis Center, the Network and Information Center, and the Educational Technology Center. 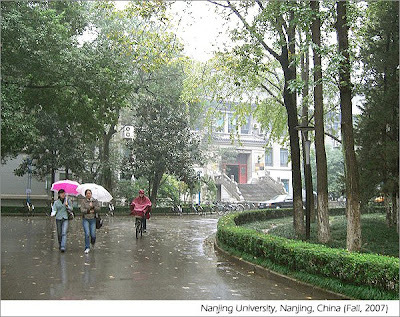 Nanjing University is one of the most active universities in China in its international academic exchanges. Since 1979, it has set up links with more than 180 universities and institutions in nearly 30 countries, employed over 1,800 foreign scholars to teach and give lectures, held more than 120 international conferences, and more than 2,500 teachers have been sent aboard to pursue higher degrees and conduct research. In the meantime, more than 6,000 international students have studied at this university. Nobel Prize laureates, such as Professors Chen Ning Yang, Tsung Dao Lee, Ilya Prigogine, Sheldon Glashow and Robert Mandel have been conferred Honorary Doctorates, or Honorary Professorship by the university. A large number of world famous statesmen, scientists and social activists, such as former US President George Bush, former French President Francois Mitterrant, and former Australian Prime Minister Robert Hawk have also visited Nanjing University. In order to learn from international experiences of teaching, research and management, Nanjing University has been exploring international cooperation of various modes and levels. The University jointly founded the Center for Chinese and American Studies with the Johns Hopkins University of the United States, the Sino-German Institute for Law with Gottingen University in Germany, and the Lab of Multi-Media Long Distance Satellite Teaching System with the Japanese Ministry of Tele-Communication. As a successful model of Sino-US educational cooperation, the Center for Chinese and American Studies has received attention and acclamation from the leaders of both countries and has become well known in the academic world. It is regarded as "an ideal place for students to learn western culture without going aboard."